Bloggie Bestie Blog Swap - Featuring Truly Lovely! 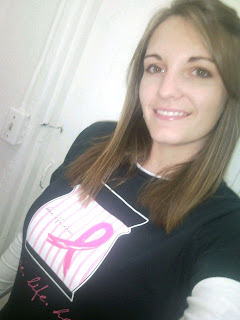 Hello friends and followers of Naturally Me Creations!!! I am so excited to be here, blog swapping with Miss Monique! PLEASE, PLEASE don't brush aside this post as, 'It's just a guest blogger... No Monique loveliness today'... and then carry on through your blog roll! That would make me so sad!! I am thrilled to get the chance to share a little about myself and my blog with you lovely Naturally Me readers, so PLEASE stick around!!! My name is Kassi! I, along with my sister, Kayli, produce Truly Lovely!! We've only been blogging for a few short months, but like most things we Laney Sisters do, we jumped in head first!! AND we love it! We love the community, sharing ideas, and learning new things from other bloggers, like Miss Monque!! The things that we find to be Lovely include crafts, such as these personalized tile coasters that I made as a cheap, easy, but still lovely gift! 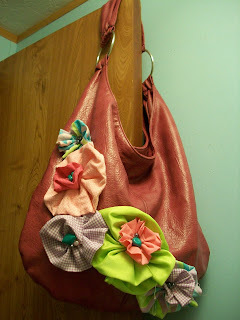 Or this upcycled purse that Kayli fancied up with some fun flowers! We also enjoy sharing our favorite recipes... Which have included these tasty Mint Oreo Brownie treats!! Besides our crafting and cooking endeavors, we share little tid bits of our lives, which at the moment revolve around Kayli graduating high school and picking a college. As well as my wedding planning for this summer! We also love showing off YOUR projects, so we host a fun linky party every Friday, with our favorites featured every following Monday! We would love to see you link up tomorrow at Fancy This Fridays!!! Like I said, we're new to the blogging world and we would love for you to stop by and share a little encouragement! We newbies can use all the help we can get! Thanks to Miss Monique for blog swapping with us today! We think Naturally Me Creations is TRULY LOVELY!! You can get your daily fix of Monique over at our blog, Truly Lovely right now!!! We hope you'll stop by and say hi! And all you lovely Truly Lovely ladies stopping by, we know Miss Monique would love having you as a new follower! We love you, so she will too!! I made this card for The Hot Spot's Natural Elements Challenge! I punched out the leaves, arranged them on the cotton paper, as well as around the centre flower after I used a green ink pad to colour them. I also punched out a small flower shape, inked it with the same brown ink as I used for the card edge, and glued it on before glueing on the shell flower. As for the cotton paper, I wet and tore it to get that effect. I inked the edges of the card with a brownish ink, glued on gold card stock, added a strip of stripy decorated brown paper and some pearls. I must have had card makers block, since it took me about 2-3 days to finish up this card, hehehe. By linking up you give me permission to post photos from your blog in my weekly features - credit will be given to you of course! I'm probably one of the worst (part time) housewives one can find...it's not that I don't want a tidy house...it's just that I'm not motivated enough to do something about it most of the time! :0 Thing is, I've always thought of Saturdays as house cleaning days, which meant that I'd leave ALL the chores for Saturday, which of course then made it seem overwhelming for me...hehe. I glued them to the frame with ordinary craft glue, and finally added some 3D kitty stickers. I was going to stencil on some lavender, then decided on a butterfly instead since it's easier. It's not so neat - I think I had too much paint on my sponge, but I thought I'd just leave it in case I messed it up trying to make it look better. I'm not good with painting and I don't have many painting tools and brushes and things. So anyway! I added some purple blings to the butterfly (which don't look all that blingy in the photo...) and then spray varnished the board and letters. I also added some blings to the letters. Then I just glued on the letters, leaves and flowers with a glue gun. Before gluing the bees, I had to remove their legs otherwise I couldn't get a good glue hold on them...it was kinda gross because it almost felt like I was dismembering a real bee.